It's confession time: This CD has been sitting on my desk since before it was released back in 2000. We try to review everything we receive here at RoughEdge.com and we like to do it in a timely manner. That's not always possible thanks to the amount of CDs we receive but nearly two years from receipt to review is ridiculous and I apologize. That being said, I must add that - as far as Enuff Z'nuff are concerned - the delay of review is to their benefit. When I first received the CD, I didn't like it at all. "Why would a band so closely emulate the Beatles?" I thought, "Especially someone known as a hard rock band?" I put the CD aside and nearly forgot about it until I picked it up recently, plugged it in and - guess what? - I liked it! Yeah, there's a lot of Beatle-esque moments on "10," but there's lots of Cheap Trick moments here as well. And, appropriately, even more Enuff Z'nuff moments. The songs on "10" may not be heavy enough for many RoughEdge.com readers, but their poppy, solid rock'n'roll sound make for some interesting listening. My favorite songs on the CD are the opening track ("There Goes My Heart") which is surprising because it's the tune that most turned me off originally; the hilarious and locomotive-like "You're Heart's No Good .. But I Love Your Face" and the very Rick Nielsen-ish "Bang On." And speaking of Cheap Trick, a cover of their "Everything Works Out If You Let It" also appears here. Fans of the Beatles, Cheap Trick and bands of their era / ilk / sound will find lots to like on "10." The CD also includes a video of "There Goes My Heart." 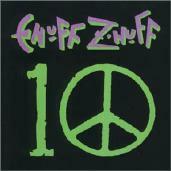 For more information, check out http://www.enuffznuff.com.